News industry leaders are doubling down on their focus on subscription services going into 2019, with half of the editors-in-chief, CEOs, managing directors, and heads of digital citing subscription services as their main revenue source for the new year. The news industry continues to find their footing as the field undergoes major changes grappling with the question of how to turn a profit. Notably, about one in three news industry leaders will be looking to display and native advertising as their main revenue focus for the next year. Ad revenue was the industry’s bread and butter prior to the digital age. Many people surveyed for the Reuters Institute for Journalism Predictions for 2019 cited the cut-neck and cut-rate advertising game fueled by big tech as the major reason news organisations are no longer able to play the advertisers game in the same way. Platforms like Google and Facebook can provide access to a targeted audience more efficiently and at a scale that puts media organisations at a competitive disadvantage. 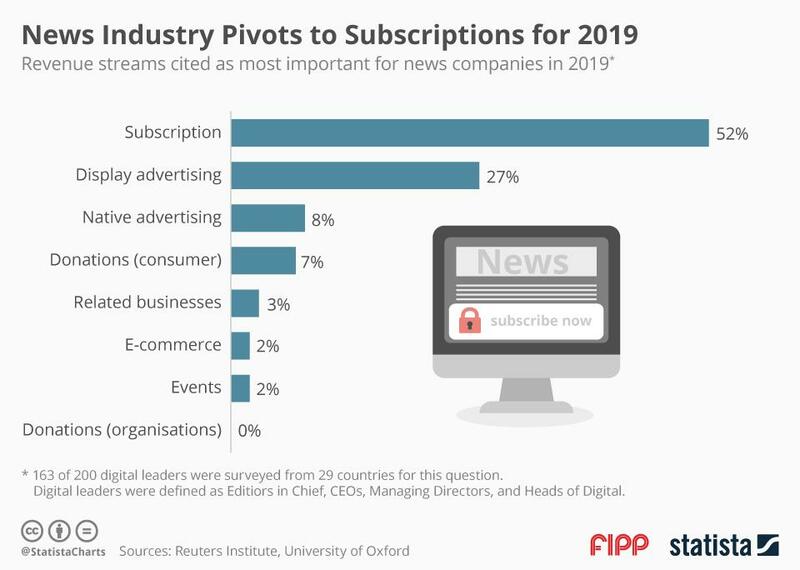 This year is shaping up to be the year of diversified revenue streams as subscription services surge to the top of news industry leaders’ priorities.